Directors - A Positive Culture Is Vital! If you want your company/organisation to be successful, directors/committee members have to embrace the development of a “positive culture”. In this article we have summarised comments made by Andrew Geddes, the recently retired Chairman of Greencross Limited, whilst commenting on Greencross’ journey from a small company (founded by Dr Glen Richards) to an “ASX Top 200 Company” where directors and senior managers committed to the creation of a “positive culture” which Andrew Geddes says was vital for the success of Greencross Limited. After the appointment of the Chief Executive Officer the most vital task to be championed by the Board of Directors in a company or the committee of an organisation, is to ensure that a “positive culture” has been created within the company or organisation. Andrew Geddes is one of the keynote speakers in the Corporate Governance Network webinar/workshops being presented by ESS Small Business. Many of Andrew’s observations apply to all types of companies - large and small and to all types of not-for-profit, charities, sporting and social organisations. 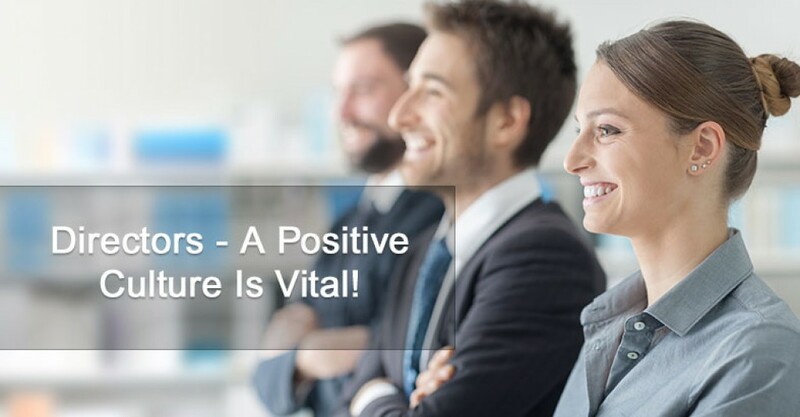 Directors of companies and committee members of organisations need to monitor the implementation of a “positive culture” within the company/organisation. Where do you start on the implementation of a “positive culture”? Companies and organisations need to appoint a CEO who will then appoint a strong management team. Directors need to ensure that appropriate systems have been implemented so that management will be receiving information that they can use to manage the business and directors will be able to review the systems to ensure that everything is functioning satisfactorily in the company. Appropriate for the type of business that the company/organisation is operating e.g. retail systems, or systems appropriate for a tradie business or manufacturer or a charity. Appropriate for the company or organisation. This is very important because there are some aspects of people management that directors can be personally liable for. Is this being handled appropriately? Are products/services being priced according to the methodologies implemented for the company/organisation? Is the strategy being implemented? Is there evidence that the team is working together relative to brand development and marketing? If the company wants to raise capital there is usually some additional work that has to be undertaken which should contribute to the culture within the organisation. If a company goes to the public to raise capital, there is an expectation that the company will invite one or two experienced directors onto the board to enhance the company’s reputation and to give the company the benefit of the experience that a new director will have. If the business’ current accountant is only interested in preparing annual accounts and income tax returns in most cases that accountant will not be suitable for the capital raising phase and possibly the Chief Financial Officer role for the company because they will not have the experience in been directly involved in the day-to-day activities of a fast-growing company. A company seeking to raise capital will need to appoint a commercial lawyer to assist them in this process. The directors should ensure that the executive team comprising the Chairperson and the senior management team work together in a satisfactory manner so as to contribute to the culture of the company/organisation. There is a focus on the development of the “culture” within the company/organisation. “Core values” have been identified and have been communicated to the management team and the other team members in particular identifying – what is acceptable – what is not acceptable. How is the company performing against the strategy that has been set? Directors should be satisfied that the structure of meetings within the company/organisation will contribute to the “company/organisation culture”. Directors should enquire as to what has happened relative to skills development of the total team within the company/organisation. Andrew Geddes highlights the desirability of directors ensuring that management has prepared a “Core Value Statement” and that it is being implemented. Andrew indicated that it is vital that the management team develop a “story” around each of these “core value items” and these “core values” are communicated to all team members and are openly discussed in team interviews, induction of new team members, performance appraisals. Andrew indicated that this was the journey that Greencross Limited had implemented to guide the company on its transition from a small company based in Townsville to an “ASX Top 200 Company” – these processes all contributed to the creation of a “positive culture” within the company. Andrew Geddes is presenting three presentations in the webinar/workshops as part of the Corporate Governance Network. You can find out more information on the Corporate Governance Network please logon to the ESS Small Business website – click Corporate Governance Learn More. Subscriptions for the full program of nine webinar/workshops in 2018/2019 is $499 including GST or you can subscribe for individual webinar recordings for $78 including GST per webinar recording. Click here to download a free recording of the first Corporate Governance Network Webinar/Workshop. News, ideas and tips helping small business with strategies to survive and thrive in today's economy. Episode 019 - Directors - A Positive Culture Is Vital! If you wish to receive future editions in the Survival Hints for Small Business series, you can visit our iTunes – Podcasts - Survival Hints for Small Business page and subscribe to our podcasts. If you have any questions or suggestions on future items to be covered in Survival Hints for Small Business, please don’t hesitate to contact us.